2. What is "cardNum" column in exported file and how can I use it? From version 1.17 Flashcards Buddy offers the way to update the existing card's content using Google Docs import feature. We implemented the concept of "CardNum". This is a Google spreadsheet column where the unique card number ( = card identifier) is displayed. With the help of this card number, Flashcards Buddy knows if the currently importing card is already existing in its database or not. However, There was limitation. The unique number was always generated by Flashcards Buddy and users cannot change the card number. We implemented better "CardNum" concept. In new concept, Flashcards Buddy doesn't generate card number any more. CardNum is generated by user! User can use any value as long as the value is unique in one spreadsheet. 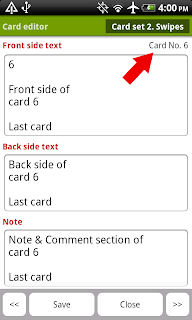 CardNum is the identifier of each cards, if the same CardNum is given to two or more cards, Flashcards Buddy will be confused and will update only one of those. Please make sure to keep the value in CardNum column "UNIQUE". Each card in Flashcards Buddy can have a unique id number provide by user. This id number can be found in top-right corner in “Card editor” screen and is always included in “CardNum” column of export files. From version 1.17, Flashcards Buddy checks the existence of this number and will do extra processing for data import. The detail goes as follows. 2. If Flashcards Buddy sees the “CardNum” column in Google Docs, it does extra check whether there is corresponding card exists in Flashcards Buddy database. If it finds a card with same card number, it will update the card. Otherwise, Flashcards Buddy will think the card as new and create one. 34 ............ "I am the first card"
35 ............ "I am the second card"
36 ............ "I am the third card"
and you have entered following record in Google Spreadsheet and run import. 36 ............ "I am the new update"
The result of import is "Update" of the card 36 and you will see the front side text is updated to "I am the new update"
Now, you have following record and run import. 96 ............ "I am the new update"
You will see "Creation" of new card because the number cannot be matched to any cards in selected card set. Step 1) Go to Google Docs and create spreadsheet with "CardNum", "Front" and "Back" column. 34 ............ "First front" ..... "First back"
35 ............ "Second front" .. "Second back"
36 ............ "Third front" .... "Third back"
Step 3) Create new Card set and name it "Test"
Step 5) Find the spreadsheet you create in Step 1) and press "Import All". Then you show see three new cards created in "Test" card set. Step 7) remove first two rows (CardNum 34 and 35) and change the front side text of Card 36 to "Update". Step 9) import the revised spreadsheet. Step 11) Change the CardNum 36 to 96. There's no card with Card number 96 "Test" card set, you should see new card created after the import.